Welcome to Thor’s Original Story, at Superheroes Central we’ve put together this great page to answer some basic questions about the god of thunder that people are curious to know about including his first comic book appearance and both his secret identity and his world of origin. If your a big fan and would like to also know what Thor’s powers and abilities just click here otherwise keep reading and enjoy. When was Thor created? It was in 1950, Thor’s origins begin in Marvel Comics. Thor is a popular and much loved superhero figure, this is due to his creators Don Rico, Stan Lee, Jack Kirby and Larry Lieber. Making his first appearance in the comic Venus #11, November 1950 in this comic Thor was just a supporting character and it wasn’t until Journey into Mystery #83, August 1962 did Thor truly enter the spotlight. Along with Ant Man, the Hulk, Wasp, Iron Man and Captain America who was retrospectively granted founding member status he helped form the Avengers, a group of Earth’s mightiest heroes. While it’s true that Donald Blake is Thor, the truth is far more complicated than that, you see Thor is the son of Odin, All-Father of the Asguadians(a race of nearly immortal peoples who hail from one of nine mystically connected realms) and also of Gaea, the goddess form of the Earth itself. Odin wanted a son who would be incredibly powerful on both Asgard and Midgard (as the Earth realm is called by Asgardians), The goddess Frigga, Odin’s wife, acted as Thor’s mother from that time onward, where he was raised with his foster brother Loki. 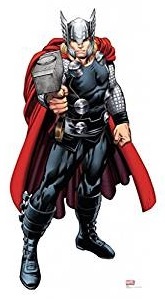 As an Asguadian Thor is near immortal, and nigh on invulnerable, possessing incredible strength durability and when he unleashes his devastating war hammer Mjölnir, he also gains the ability of flight and is able to summon storms and call lightning to smite his foes. During the 9th Century AD, Thor traveled to Earth to promote his worship among the Vikings. The Norsemen came to worship Thor and the other Asgardians as gods given that none could stand against them. Thor encouraged the vikings to do battle and in doing so find glory. When Thor discovered that the more aggressive followers were committing atrocities in his name, he was appalled and ashamed. Thor then withdrew from Earth altogether, and the active worship of the gods of Asgard effectively ended. Centuries later, the only memories and references that history would record of the Asgardians would be through myths and legends. But Odin did not send his son to Earth as a god, but rather though the use of enchantments sent him back in a mortal form under the guise of Donald Blake a partly crippled medical student. Odin also sent the hammer Mjölnir, which has many enchantments upon it, one of which is that it can only be wielded by someone worthy, and utterly impossible to lift if you were not so. Stripped of memories Donald Blake became a successful doctor and grew to be compassionate and humble, Odin sensing he was ready, planted a suggestion within Blake’s mind to take a trip to Norway where a evil threat lurked and Mjölnir(in the form of a wooden cane awaited), During the confrontation Donald Blake grasped Mjölnir and Thor was reborn once more. As his memories returned to him Thor realized that he wanted to stay and protect Earth, as he had made a life here as Donald Blake, including falling in love with Jane Foster, a relationship Odin did not approve of given Jane’s mortality. So Thor remained on Earth having many adventures and was even a founding member of the avengers. Life was not easy as he grew into conflict with his father’s wishes and Loki’s jealousy, and he assumed many identities other than the Donald Blake persona. finally Thor is in the movies and has been brought to life on the big screen, he is introduced as a powerful warrior, who is both arrogant and conceited. 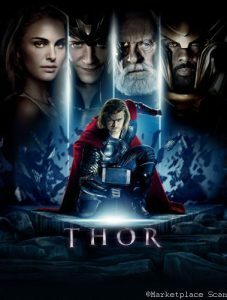 Lacking his fathers wisdom he is easily manipulated by his brother loki into violating Odin’s commands, this results in near fatal consequences and a resumption of war between the frost giants and the asgardians, after being rescued by his Odin and his army, Thor is stripped of his powers and sent to earth to learn humility. There he meets and falls in love with Jane Foster. Not content with Thor’s banishment, Loki assumes the Asgardian throne for himself and sends the Destroyer(a supremely powerful guardian robot which usually guards the Asgardian weapons vault, which itself contains some of the powerful and dangerous relics and weapons in the known universe) to eliminate Thor for good, but in doing so, unwittingly restores Thor’s power to him, when Thor sacrifices himself for the sake of others, and with act proved himself worthy to wield Mjölnir. After overthrowing Loki and returning his father to the throne Thor remained on earth to become a protector and founding member of the Avengers. All images featured on this page are available from Amazon, also click if you would like to see a selection of the best Thor accessories, or find out more information on other awesome superheroes at Superheroes Central.